Hard Candy Custom™ Paint: Hard Candy Custom™ is a large metal flake finish that’s more than just paint job, it’s a shining declaration of independence—bright, bold and unique. 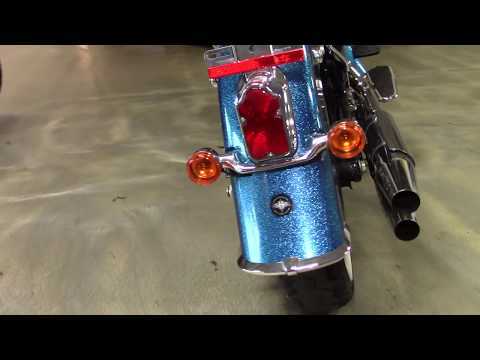 The Softail Deluxe is available in Hard Candy Cancun Blue Flake. Recalling the iconic rebel styling of ‘70s custom bikes, Hard Candy Custom marks another milestone in The Motor Company’s legacy of innovation. We start with several passes of 200 micron flake over a silver base, then clear coat it, hand-lay and mask the pattern and apply the Candy color to allow the flake to shine through. Then more clear coat and hand striping to a deep smooth finish. It’s a painstaking process that delivers a premium custom look straight from the factory, so you can start flying your colors with no waiting, no stripping or extra effort. Standard Anti-Lock Brakes: When it comes to the Softail® Deluxe model with ABS, "stopping power" has a double meaning. The components of our ABS are tastefully stylized within the wheel hub, so you'll still turn heads with clean, streamlined design. More importantly, though, you get certainty in the saddle knowing your bike's going to behave when you need it.